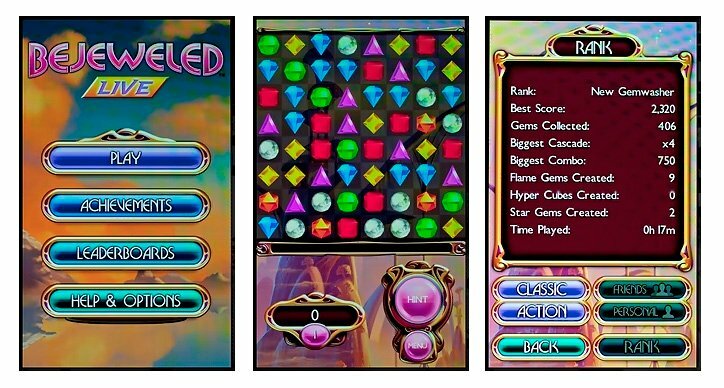 Pop Cap Games Bejeweled is a classic puzzle game that's been around the smartphone industry for years. It has developed a reputation for being an addictive, entertaining game and with Windows Phone 7, Bejeweled Live doesn't disappoint. The game play itself hasn't changed much. You are presented with an 8x8 playing field of colored jewels. The goal is to line up at least three of a kind. Your moves are limited to horizontal and vertical but you can only move jewels that will complete the string. The longer the string, the more points you collect. When you match them up, the jewels explode and the playing field is replenished from the top with more jewels. You have three gaming modes, Classic, Race the Clock, and Endless Play, to keep things interesting. As you complete the various levels within each mode, it becomes harder to find moves and the overall pace increases. When you're stumped, there's always the hint button to offer a friendly suggestion. The "Live" in Bejeweled Live comes into play with the integration with Xbox Live. Your scores and performance are recorded with your Xbox Live account and you can compare your performance up against other Bejeweled Live competitors. Bejeweled Live is a stable app that is extremely addictive. The graphic quality is fantastic and the background music isn't bad either. You can find the gaming app over at the Marketplace for $4.99. A trial version is also available if you prefer to try before you buy. If you like addictive, entertaining, puzzle games Bejeweled Live (Store link) should be on your Windows Phone.